While spring is still a long way away we can still make it feel fresh, clean, and airy indoors with some deep winter cleaning. Take it a day at a time with these small tasks to clean and organize and watch your house sparkle! Instead of spending a month breaking your back getting it all done instead we will help break it up into smaller tasks over the entire year. 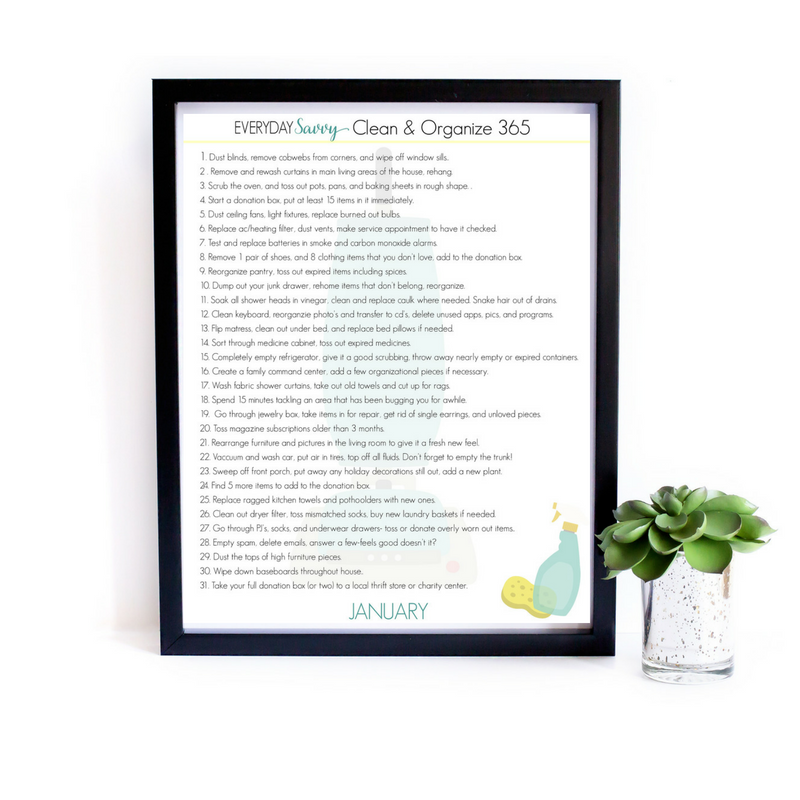 We even have a printable monthly checklist that you can laminate and hang on your refrigerator or slip into your planner. I will be sharing 365 simple tasks that can be done each day to help you get your house in order this year. Most tasks should take 15 – 30 minutes. If it works for you do each task on the corresponding date, if not just use it as a list of tasks, some days you may get more than one done. You may wish to take off the weekend and double up on weekdays or vice versa. I want you to be successful so do what works best for you. Here is the full list of tasks with some links to tools that will help! Thin out Takeout menus, condiments, and supplies – We all have one of those drawers or baskets that overflow with sweet and sour sauce and sporks. Weed out menus and condiments, wipe it down if needed. Wash throw pillows throughout house, place in dryer with a tennis ball to help shape- Remove cases if pillows are not machine washable, this will really help freshen up the living space. Wash throw rugs, hang area rugs outdoors to air out, spot clean as needed- Pound rugs with a sturdy stick to remove dirt if they can’t be laundered and attack spots left over from the holidays before they set in. Wipe down kitchen chairs from top to bottom and table legs or base with wood cleaner- A dreaded task to be sure but toast crumbs and dust add on on these spots and they need it! Go through 2 kitchen cabinets toss or donate unused mugs,etc..- Most of us have a cabinet filled with mom mugs and chipped saucers, let’s thin it out! Run a vinegar then water cycle through your coffee pot- I run a full pot ( or about 2 reservoirs full for a single cup brewer) and then several water cycles to rinse. Swap out 5 photos in the frames hanging up on your wall to freshen up the area- Changing things up just a bit creates a new area for your eyes and makes it feel updated. Grab a garbage bag, set a timer for 10 minutes- Make a quick sweep filling with items to donate. Hit every room in your house and grab at least one or two items from each. Scrub behind and at the base of your toilets- Let cleaner soak for 10 minutes before wiping away, use a toothbrush around the floor bolts to get in really good. Wipe down all switchplates in your home with antibacterial cleaner- It’s a good idea in the middle of flu season to hit those forgotten areas and kill the germs. Clean off the top of the refrigerator- Wipe with a good degreaser and avoid putting anything back if you can help it. Keep clutter to a minimum! Go through t shirt drawer, get rid of stained, ill fitting, or unwanted tops – One drawer at a time and before you know it we will have the dresser in order! Rub coconut or olive oil onto your wooden cutting boards to recondition them- Add a drop or two of your favorite essential oil, work it in with a soft cloth and remove excess. This will extend their life and make them look pretty on your counters. Season your cast iron pan- Seasoning your cast iron pan keeps it in top shape and will make your recipes turn out perfect everytime. Scrub cast iron with hot soapy water, dry well, rub with a thick coat of vegetable oil using a cloth, bake upside down in an oven preheated to 325 for one hour (place a piece of foil on the lower rack to catch drips). Clean out under kitchen sink, safely dispose of chemical bottles- Toss out empty containers, add items you are low on like sponges to your shopping list. Dust/Clean all TV screens throughout the house- Dust builds up and while it is not as noticeable as the TV is running it shows terrible when it’s dark. This electronics cleaner can make the job easy! Put a fresh box of baking soda in the fridge and freezer- If you haven’t changed it in awhile now is the time. This 1 minute job makes a big difference on the smell or lack thereof in your fridge and freezer. Take 15 minutes to gather and organize tax information- Begin tidying and making a folder for your receipts and other documents you may need for taxes. Wipe down all interior doors throughout the house with a damp rag- Use a magic eraser for stubborn marks and scuffs. Have items waiting for repair or dry cleaning? Make a trip around town and drop them off, stop for an iced coffee or ice cream to treat yourself for a job well done. Wash pet bedding and any clothing they may have, air dry- Your pets and your nose will really appreciate fresh clean smelling bedding. Add a comfy blanket to keep them cozy through the remaining winter. Clean hair brushes thoroughly- Use a comb to remove as much hair and dust from brush as possible. Soak brushes in hot soapy water for an hour, rinse, and allow to dry. Dust all pictures and decor on the walls- Use a telescoping handle to get high and cut the dust down on out of reach photographs. This microfiber duster set with extendable handle makes the job easy. Wipe down window sills throughout the entire house- A quick swipe of the sills takes just a minute but will have a big impact. Scrub the front door well, change out your winter wreath if you have one- Create a welcoming front door that sparkles. Visit the kids closet and pluck out 12 items to add to your donation box- Clothes, toys, games, etc…Even if you did a Pre Christmas cleanout you can surely squeeze out a few more items. Give couches , throw pillows, and drapes a good spray with fabric deodorizer- I love this natural alternative to Febreze. After the many bodies that have graced your couches during the holidays( some sleeping on them all night) they need a good freshening up! Spend 10 minutes on the game shelf, toss games that are missing pieces, donate those not played with. Treat the family to a game night tonight! Looking for fun new family games? We love Exploding Kittens and Apples to Apples. Plus if you spend $39, you’ll get a beautiful stoneware tray for free! It’s perfect for holding your soaps and a sponge. It should work now. There was an issue with the hosting of the files but it is fixed now.